PRIVACY AND STUDENT DATA: AN OVERVIEW OF FEDERAL LAWS IMPACTING STUDENT INFORMATION COLLECTED THROUGH NETWORKED TECHNOLOGIES | June 29, 2016 | Cyberlaw Clinic Assistant Director, Dalia Topelson Ritvo, with the help of clinic students, Cyrstal Nwaneri and Makala Kaupalolo, published an updated guide to help K-12 schools navigate the federal laws that apply when introducing networked technologies both in and out of the classroom. The goal of the guide is to help schools, administrators and teachers make more empowered decisions on how to use networked technologies in a way that complies with federal laws protecting student privacy. LEGAL AND ETHICAL ISSUES IN THE USE OF TELEPRESENCE ROBOTS: BEST PRACTICES AND TOOLKIT (WORKING DRAFT) | March 27, 205 | Spring 2015 Cyberlaw Clinic students Jack Xu and Cecillia Xie teamed up with the Clinic’s Managing Director, Chris Bavitz, and J. Nathan Matias and Chelsea Barabas of the MIT Center for Civic Media to prepare a working draft paper entitled “Legal and Ethical Issues in the Use of Telepresence Robots: Best Practices and Toolkit.” The paper was submitted for discussion at the WeRobot 2015 conference held April 10 – 11, 2015 at University of Washington School of Law in Seattle, where Cecillia, Jack, Chris, and Chelsea joined discussant Laurel Riek of Notre Dame for a panel discussion. The working draft builds on work the Clinic did with Nate and Chelsea in connection with their “People’s Bot” project and lays the groundwork for development a broader toolkit examining privacy and related concerns that arise in connection with the use of telepresence robots. 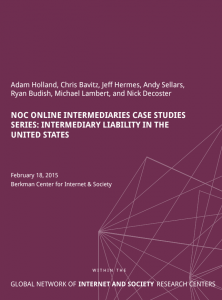 NOC ONLINE INTERMEDIARIES CASE STUDIES SERIES: Intermediary Liability in the United States | February 18, 2015 | The Clinic helped prepare a far-reaching report released by the Global Network of Internet and Society Research Centers and the Berkman Center for Internet & Society at Harvard University, addressing questions about intermediary liability around the world. The report consists of: (a) a case study series exploring online intermediary liability frameworks and issues in Brazil, the European Union, India, South Korea, the United States, Thailand, Turkey, and Vietnam; and (b) a synthesis paper that seeks to distill key observations and provide a high-level analysis of some of the structural elements that characterize varying governance frameworks, with a focus on intermediary liability regimes and their evolution. Clinical Fellow Andy Sellars helped to support the project overall, and he — along with the Clinic’s Managing Director Chris Bavitz and two summer 2014 Cyberlaw Clinic interns, Nick DeCoster and Michael Lambert — helped to craft the US case study. 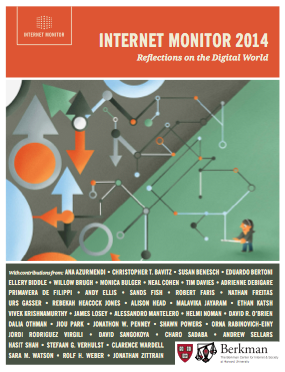 INTERNET MONITOR: Reflections on the Digital World | December 16, 2014 | Clinical Instructor Vivek Krishnamurthy, Clinical Fellow Andy Sellars, and Managing Director Chris Bavitz contributed to the Internet Monitor’s second annual report, “Reflections on the Digital World,” a collection of essays addressing developments in the digitally networked environment. Andy’s piece explores the elements of existing copyright law that allow the government to replicate parts of SOPA, despite its despite in Congress, and the resultant harms to free speech. In “ABC v. Aereo, Innovation, and the Cloud,” Chris analyzes the logic behind the Supreme Court decision, and how it might impact a variety of services that operate remotely, as well as innovation in the space. Vivek comments on a trend in Western countries to expand their jurisdiction extra-territorially through the internet and the potential ripple effects for human rights. 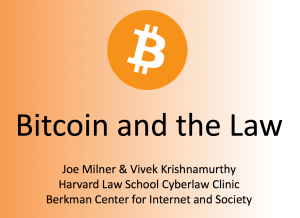 On December 3, 2014, Fall 2014 Clinic student Joe Milner, along with Clinic Instructor Vivek Krishnamurthy, delivered a presentation to the MIT Bitcoin Club about legal issues surrounding bitcoin, an online cryptocurrency, from taxes to privacy to currency regulation. Their presentation details the current standing of bitcoin in several different countries, and offers general thoughts on using bitcoin for transactions and developing software around the system. The Cyberlaw Clinic has teamed up with WGBH to support the extraordinary Boston TV News Digital Library project. The Clinic’s work with WGBH has focused on offering guidance to news media archivists on legal issues associated with archiving news content. 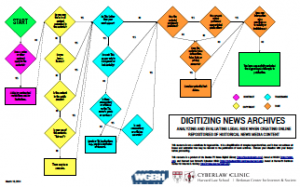 To that end, the Clinic and WGBH are pleased to announce the release of the “Digitizing News Archives” flowchart, which provides a high-level overview of some key legal questions that may arise when one digitizes news content and makes it available online. The chart offers a suggested order of operations and a process for considering and managing legal risks while striving to maximize the availability of historic footage and other media content online. On Friday, March 21, 2014, the Consortium of School Networks (“CoSN”), with the help of the Cyberlaw Clinic, released an in-depth, step-by-step privacy guide — the “Protecting Privacy in Connected Learning Toolkit” — to help school system leaders navigate complex federal laws and related issues. Issued as part of CoSN’s new Protecting Privacy in Connected Learning initiative, the toolkit addresses compliance with laws such as the Family Education Rights and Privacy Act (“FERPA”) and Children’s Online Privacy Protection Act (“COPPA”) and offers smart practices to better protect student privacy and their data. CoSN is the premier professional association for schools system technology leaders, aiming to empower educational leaders to leverage technology to realize engaging learning environments. INTERNET MONITOR: Reflections on the Digital World | December 12, 2013 | Clinical Instructor Dalia Topelson and the Cyberlaw Clinic’s Managing Director, Chris Bavitz, contributed to the Berkman Center’s 2013 Internet Monitor Annual Report: “Reflections on the Digital World,” a unique collection of short essays addressing notable events and trends in the digitally networked environment. 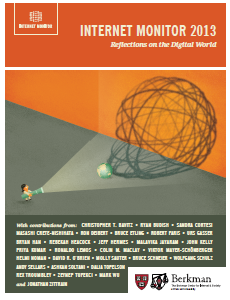 Dalia’s piece, “The New Guard,” reflects on the implications of moving data and information to digital platforms while Chris Bavitz and former Cyberlaw Clinic student Bryan Han team to provide an overview of India’s IT Act and the scope of protection for online intermediaries in India. PRIVACY AND CHILDREN’S DATA: An Overview of the Children’s Online Privacy Protection Act and the Family Educational Rights and Privacy Act | November 13, 2013 | In collaboration with the Student Privacy Initiative at the Berkman Center for Internet & Society, the Cyberlaw Clinic released this briefing document addressing two of the major federal legal regimes that govern privacy of children’s and students’ data in the United States: the Children’s Online Privacy Protection Act (commonly known as “COPPA”) and the Family Educational Rights and Privacy Act (commonly known as “FERPA”). The guide aims to offer schools, parents, and students a basic understanding of some of the laws that may apply when cloud computing tools are used for educational purposes. NEWSGATHERING IN MASSACHUSETTS: An Overview of Legal Protections for Reporters Collecting Facts and Gathering Information in the Commonwealth | White Paper | May 4, 2013 | The Cyberlaw Clinic and Digital Media Law Project released this white paper to coincide with the celebration of Cambridge Community Television’s 25th anniversary and CCTV’s “Filling the News Gap” event. 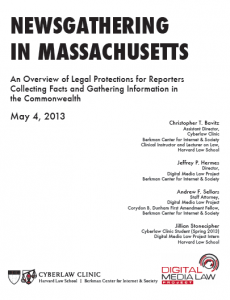 The paper highlights several categories of laws relevant to independent journalists and newsgatherers in the Commonwealth, including state statutes governing open meetings and public records, revisions to Massachusetts Supreme Judicial Court Rule 1:19 (which concerns the recording of court proceedings), and federal caselaw interpreting the state wiretap statute as it applies to recording of public officials in public places. WEB HOSTING PROVIDER LIABILITY FOR MALICIOUS CONTENT | White Paper | August 3, 2011 | A Cyberlaw Clinic student and Clinic client, StopBadware, working with Clinic Assistant Director Christopher Bavitz, prepared this white paper (pdf) as a complement to StopBadware’s Best Practices for Web Hosting Providers: Responding to Badware Reports (pdf). The paper addresses legal liability issues that relate to the hosting of malicious content and, specifically, the applicability of Section 230(c) of the Communications Decency Act to webhosts that host malicious content. RETHINKING MUSIC: A BRIEFING BOOK | Rethink Music Conference | April 24, 2011 | Cyberlaw Clinic Assistant Director Christopher Bavitz, working with Clinic students and a Research Assistant, assembled this publication to coincide with the Rethink Music Conference held in Boston in April 2011. 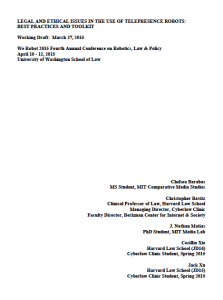 The Berkman Center’s briefing book incorporates an original framing paper (pdf) and compiles contributions from a wide range of music law, business, and policy stakeholders. BEST PRACTICES IN THE USE OF TECHNOLOGY TO FACILIATE ACCESS TO JUSTICE INITIATIVES | Preliminary Report | July 30, 2010 | Several Cyberlaw Clinic students, working under the direction of Cyberlaw Clinic Director Phil Malone, prepared this preliminary report in an effort to help the Massachusetts Trial Court work toward a comprehensive, holistic strategic plan for maximizing technology’s role in the Commonwealth of Massachusetts’ Access to Justice Initiative. SEXTING: YOUTH PRACTICES AND LEGAL IMPLICATIONS | Report for the Youth and Media Policy Working Group Initiative | June 22, 2010 | Cyberlaw Clinic students and Cyberlaw Clinic Assistant Director Dena Sacco prepared this report for the Risky Behaviors and Online Safety cluster of the Youth and Media Policy Working Group Initiative. 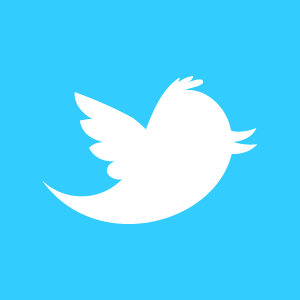 The report is intended to provide background for a discussion of interventions related to sexting. AN EVALUATION OF PRIVATE FOUNDATION COPYRIGHT POLICIES, PRACTICES AND OPPORTUNITIES | Report | August 16, 2009 | Cyberlaw Clinic Director Phil Malone and several Cyberlaw Clinic students prepared this report as part of a joint project of the William and Flora Hewlett Foundation, The Ford Foundation, and the Open Society Institute, with funding from Hewlett and Ford. 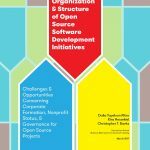 The report examines copyright licensing policies and practices at twelve private foundations, with a focus on assessing the extent to which charitable foundations are aware of and have begun to use open licenses such as Creative Commons or the GPL. ENHANCING CHILD SAFETY & ONLINE TECHNOLOGIES | Final Report of the Internet Safety Technical Task Force to the Multi-State Working Group on Social Networking of State Attorneys General of the United States | January 14, 2009 | Cyberlaw Clinic students, working under the direction of Clinic Assistant Director and Internet Safety Technical Task Force Co-Director Dena Sacco, contrinbuted extensively to the Task Force’s Final Report.